With 90 million people (Central Intelligence Agency, 2011) and nearly half of the population in the prime beer-drinking ages of 20 to 40 years old, Vietnam is an attractive market for foreign brewers. This expanding economy has grown approximately 7.5% annually for the past decade (Hookway & Nguyen, 2009). In 2010, the beer industry grew 14% in volume, reaching 2.3 billon litres (Euromonitor, 2011). There are also intensive marketing activities by large local and international players to maintain their market shares. In order to deal with this competition, major Vietnam’s state-run brewers like Hanoi-based Habeco Corp. and Ho Chi Minh City’s Sabeco Corp. are gearing up for the fight. Their strategy is to rely on less glamorous and lower margin local products that foreigners have not yet focused on. That secret weapon is the popular unpasteurized brew called ‘bia hoi’ – literally translated as ‘fresh beer’, making up about 30% of the beer market in Vietnam (Hookway & Nguyen, 2009). Because of its fragmented nature, ‘bia hoi’ is usually not monitored by the government (Euromonitor, 2011). What else is so special about this fresh beer? This paper presents an overview history and key characteristics of this local homemade fresh beer, and explains why it recently became very popular among foreign travelers. Bia hoi’s origin dates back to the 1890s, after brewing was introduced by the French (LivingIf, 2011). Back then, just one place – The Hommel brewery – brewed beer. It was very small and only capable of to producing 150 liters a day. The beer was so expensive, and hence, it was only for the wealthy people. After the French left Vietnam in 1954, the Hommel brewery was renamed as Hanoi Brewery (LivingIf, 2011). It actually took a while for this refreshing carbonated beverage to become popular, until the brewery hit on the novel idea of producing an instant draught beer known as ‘bia hoi’, literally translated as “fresh beer” or ‘gas beer’. Nevertheless, the locals still preferred the traditional Vietnamese rice wine. After the government restricted home production of spirits, people began to accept this legal alternative ‘bia hoi’ as a refreshing, low-alcohol summer drink. Bia hoi shops are now very popular and seen as one of the long-lasting images of the Northern Vietnamese culture. ‘Bia hoi’ is a special type of homemade beer, unpreserved, brewed daily and delivered in kegs to local businesses (Gray, 2010). The production process of this draught or barrel, low alcohol volume (1.5 to 2%) beer is not sophisticated and hygienic, therefore, their quality is not controllable (Truong & Pham, 2000). Unlike canned or bottled beer, ‘bia hoi’ is essentially made to be consumed during the day after it leaves the factory (Hanoi Bia Hoi Tours, n.d.). Therefore, there is no stocking of ‘bia hoi’, and outlets must forecast accordingly. They must purchase just enough to last one whole day. ‘Bia hoi’ is best when served early in the day. It is very cheap and brand-less, being sold for about 15 cents per glass (LivingIf, 2011), even cheaper than water (Juskalian, 2010). With that price, it is proud to be the world’s cheapest beer but still good value for money (Figure 1). ‘Bia hoi’ places are where most men go to drink beer on tap and eat some snacks (Figure 2). These places usually consist of a tiny indoor space, mainly for storage and food preparation. The seating is almost entirely outside, with no tables and chairs, only equipped with small plastic stools used for both sitting and placing beers and foods (Engelson, 2010). Visiting this casual setting is such a great way to start a conversation with a local resident (Juskalian, 2010). Perhaps one of Bia Hoi’s charms is also the most disturbing fact (VietnamOnline, n.d.). The unusual variety of tasty foods like roasted peanuts or fried squid that customers love are often not well prepared and have some major health risks. Both chefs and waiters do not have time to follow safe food-handling procedures. Nevertheless, the locals still love it, and that is what amazes western visitors, who might get sick after eating those foods at ‘bia hoi’ places. It is explained by the locals that their stomachs are used to these ill-prepared foods while westerners are certainly not. For first-timers, eating these foods while enjoying ‘bia hoi’ may be a challenge for them. Not merely a drink, ‘bia hoi’ has become a symbol for the Vietnamese culture and a way of life. Foreigners in Hanoi, including residents and visitors, have been seduced by ‘bia hoi’ culture. 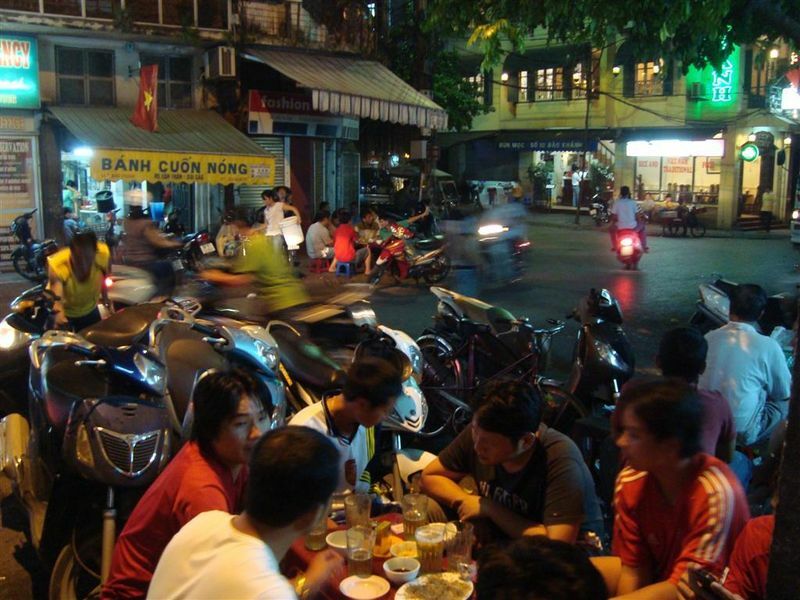 Western backpackers tell each other about ‘bia hoi junction’ at the corner of Ta Hien and Luong Ngoc Quyen streets in the Old Quarter (BiahoiHanoi, 2008). Through word-of-mouth, travelers often share tips with their friends after trips to Vietnam (Anh Ngoc, 2011). According to ‘bia hoi’ sellers at the junction, customers are mainly from UK, Germany, France and Australia. 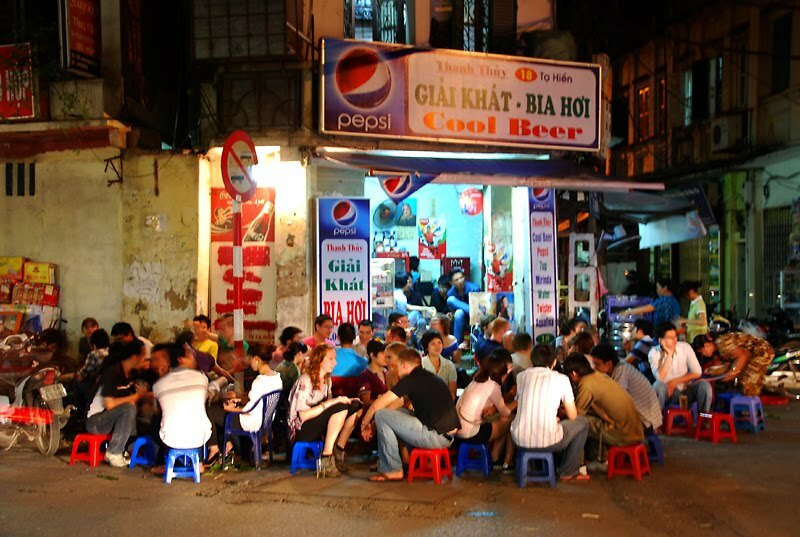 To approximately four million people visiting Vietnam each year, it is considered that drinking ‘bia hoi’ on Hanoi’s streets is as emblematic of a trip to Southeast Asia as ordering pad Thai in Bangkok (Juskalian, 2010). The first and foremost reason why these western backpackers love ‘bia hoi’ is simply its cheap price. 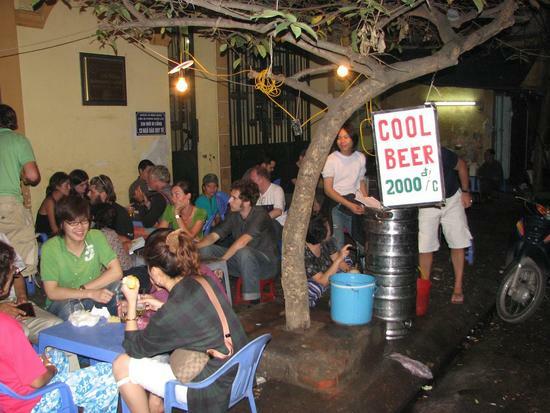 “It only costs about 20 cent for a glass of beer to cool the summer” – Margaux Schreurs, a traveler, said (Anh Ngoc, 2011). Customers also come to ‘bia hoi junction’ because for other reasons. Andrew McCracken from Australia describes the taste of ‘bia hoi’ as similar to Czech beer, and he likes its low alcohol volume. Joseph and his girlfriend like ‘bia hoi’ as they enjoy the chaotic atmosphere of vehicles, passengers, and noises from motorcycles as well as street vendors. They said, “We only need stools and few glasses of beer to stay here and enjoy the street view for hours…” For Lisa McQueen, from the UK, this experience is so different because they are used to drinking beer in bars with background music. What they really get is the enjoyment of the local hanging out scene, a group of people sharing their daily experiences over a beer (TraveltoIndoChina, 2010). The friendliness and down-to-earth attitude of Vietnamese people is another key reason why visitors love to come back to this junction. Customers like Lisa or Joseph acknowledge that they do know more about Hanoi when they come here even though these Vietnamese waiters and customers cannot speak English very well. After his fifth glass of ‘bia hoi’, Joseph said, “We stay in Hanoi for one more week, and we definitely come here again tomorrow” (Anh Ngoc, 2011). The essence of ‘bia hoi’ is that everyone is equal, and should get to drink beer at his most relaxing and truest-to-himself state. It is all about relaxation and this is exactly the way people like it. There is the unwritten rule in Vietnam that business deals are signed not on the meeting table, but on the beer table (VietnamOnline, n.d.). Therefore, among the ones coming to unwind with friends; there are also ones that come with money in mind. Despite the many drawbacks, gathering at a restaurant remains one of the most popular activities for both locals and some well-adapted foreigners alike. Why do many Vietnamese still prefer their unique bars like ‘bia hoi’ places rather than other upper-scale restaurants, which have cleaner food and overall better service? The reason lies in the fact that the essence of ‘bia hoi’ has remained unique and strong. Product quality and taste are the most important attributes of a beer brand (Euromonitor, 2011; Truong & Pham, 2000). Many global brands like San Miguel and Carlsberg are not successful in Vietnam, mainly because they do not suit the Vietnamese consumers’ beer taste. 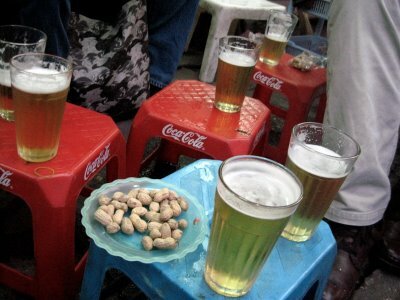 When drinking beer together, Vietnamese usually take the same brand, drink beer with ice, and sit in groups. They favor beer with little foam and a sweeter taste. People from the north prefer stouter beer, and on the other hand, people from the south prefer lighter beer. In addition, the Northerners prefer ‘bia hoi’ while Southerners prefer bottled or canned beer, for financial reasons (Pham, 1999). This consumption trend, particularly among young consumers, is gradually changing. People still claim that their choice of brand is based on their beer’s taste; but it is now seen as more status-related. This explains why, recently, companies have introduced premium brands to tap into these niche markets. While these premium brands may use extensive advertising and event sponsoring activities, suiting Vietnamese consumer’s beer taste is still seen as the key to success (Euromonitor, 2011). Despite low profit margins, ‘bia hoi’ remains an important segment that accounts for 30% market share (Hookway & Nguyen, 2009). More importantly, this unique ‘bia hoi’ experience is shared by tourists and ex pats. Euromonitor (2011). Country Sector Briefing: Beer – Vietnam. Retrieved September 5, 2011 from Global Marketing Information Database (GMID). Pham, T. H. (1999). Strategic Branding Management in Vietnam: A Case Study of BIVINA. MBA Research Paper, Bangkok: Asian Institute of Technology. Truong, Q., & Pham, T. H. (2000). Product extension: the case of Bivina beer in Vietnam. In Vietnam: Challenges Path to Development, SAV/SOM Joint Publishing, 135-159. Bia hoi ha noi is far away rom czechoslovak brewed pilsners. Czech beer is rich on flavors of hops and truly lager fermented for few days/weeks with indeed higher amount of alcohol. Bia Hoi Ha Noi reminds me more likely american Bud lite od Coors style. Color and the taste is very watery. But indeed , cheapest beer in Vietnam. Thumbs up for local experience.